XCOR Aerospace – who are believed to be close to arranging a deal to set up a base at the Kennedy Space Center (KSC) – have outlined the three versions of their Lynx suborbital spaceplane. The reusable vehicle will even include the ability to send small spacecraft to Low Earth Orbit (LEO), utilizing an upper stage, housed in an installed dorsal pod. XCOR Aerospace is a small, privately held California corporation that has a focus on the research, development, project management and production of Reusable Launch Vehicles (RLVs), rocket engines and rocket propulsion systems. KSC requires no introduction, following its world famous career launching American astronauts into space. 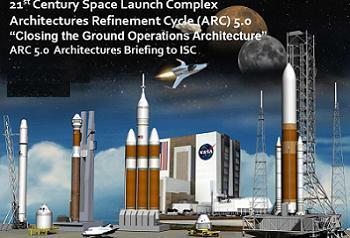 However, that is – for now – at an end, leaving the Center with an arduous task of trying to attract commercial companies to the Space Coast, as part of its “multi-user” spaceport brief. Mr Cabana, who launched into space four times on three different Shuttle orbiters, is in charge of the spaceport during this transition – a period where thousands of his collegues lost their jobs after Atlantis closed out the Space Shuttle Program (SSP) last year. It is not known which specific facilities XCOR will use, although NASA continue to repeat that negotiations are taking place with other commercial users for Orbiter Processing Facility Bays 1 and 2, as well as with potential commercial users of the Launch Complex 39 launch pads. 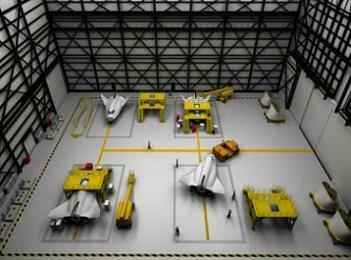 Documentation has also shown that KSC’s “wish list” is for all three OPFs to house new vehicles, namely CST-100, as already agreed for OPF-3, Dream Chaser in OPF-2 and the US Air Force’s X-37B in OPF-1. However, Sierra Nevada Corporation (SNC) have stated an OPF would only be of interest if it was a clean floor processing facility. 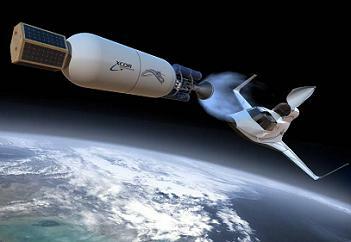 XCOR are based at the Mojave Air and Space Port in Mojave, California. However, in the future, XCOR will have more R&D, manufacturing and operational locations, such as an R&D center in Midland, Texas. Additionally, the Lynx is capable of operating from any FAA certified spaceport. As such, KSC’s Shuttle Landing Facility (SLF) is likely to be one of the more obvious preferences for XCOR, providing a launch and landing base for their Florida operation. “The region continues to be a key strategic location for companies, like XCOR, who want to build on our nation’s great legacy of innovation and entrepreneurship,” added NASA Chief of Staff David Radzanowski. Although heavily tagged as a suborbital vehicle, the Lynx range – of which there are three versions, known as Mark I, II and III – will even be capable of launching smaller spacecraft via a dorsal pod known as a “payload integrator”. “The physical configuration of Lynx Mark I and Mark II vehicles is the same. Lynx Mark I, the first vehicle produced, is a prototype vehicle that will be put into commercial service upon completion of its flight test regime. It has lower performance than the Lynx Mark II, the production version of the Lynx,” noted a fascinating Payload/Spacecraft Overview presentation for Lynx, created by XCOR this summer and available on L2 (LINK). 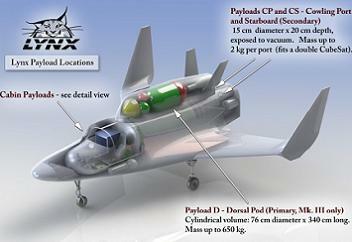 The evolvable nature of the spaceplane will see Lynx Mark I – which is in fabrication and anticipated to carry its first payloads in 2013 – fly suborbital experiments to an altitude of approximately ~200,000 feet (~62 km). Lynx Mark II, which will be available 12-18 months later, will fly a suborbital trajectory to a higher altitude, up to ~330,000 feet (~100+ km). Lynx Mark III will be capable of launching payloads destined for low Earth orbit (LEO) and will follow Mark II, pending availability. Notably, the Mark I will also have the option of the dorsal pod, albeit for much smaller payloads, without the use of the upper stage for deployment. 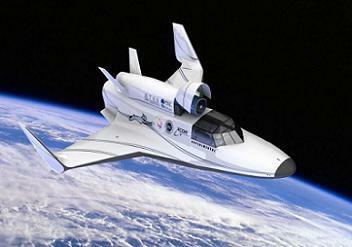 XCOR’s Lynx Mark I (prototype) suborbital vehicle is a two-seat manned vehicle with a double-delta wing and twin outboard vertical tails. The vehicle is flown by one pilot without computer assistance, except guidance and navigation displays. Lynx takes off and lands horizontally like an airplane from a spaceport runway using a three-wheel retractable landing gear, a perfect fit for KSC’s SLF, but it is by no means restricted to such a facility. The Lynx will be powered uphill via an XR-5K18 engine, a piston pump fed LOX / RP-1 motor using an expander cycle, with its engine chamber and regenerative nozzle cooled by RP-1. The Lynx airframe is composed of all composite materials with a Thermal Protection System (TPS) added to the nose and leading edges. The wing area is sized for landing at moderate touchdown speeds. The presentation shows the Mark I will be able to lift off after 13 seconds of rollout on the runway. 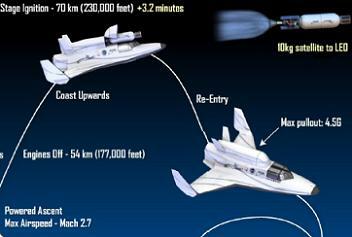 After 158 seconds, the engine is shutdown, allowing the spaceplane to “freefall upwards”, reaching an apogee of 61 kilometers after 234 seconds, at which time the vehicle begins to freefall back to Earth. 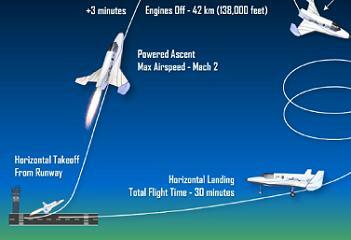 A pullout acceleration of 3.5G is predicted, followed by a touchdown on the runway, 25-30 minutes into the mission. The Lynx Mark II flies the same flight sequence as the Lynx Mark I, with the exception that Mark II is under thrust for a longer time, reaches a higher apogee (100 km), and takes longer to return to the ground (30 minutes). The typical Lynx Mark II mission profile provides a longer duration of low-acceleration and a lower minimum acceleration than the Lynx Mark I mission profile. Lynx Mark III is the Mark II modified to carry a 650 kg payload on top of the vehicle in place of internally carried payload mass. Mark II will typically weigh approximately 5000 kg at engine ignition. Performance enhancements allow the Lynx Mark II to reach higher altitudes and carry heavier payloads. “The larger Mark III fairing can hold upper stages capable of inserting a micro- or nano-satellite into LEO, or carry an oversized payload experiment, space telescope, or other remote sensing device to name a few envisioned uses,” the presentation notes. The flight profile matches the Mark I and II events, but this time heads to an apogee of 70kms and then deploys a booster with a payload from its dorsal pod, allowing for this “second stage” to head off into Low Earth Orbit, while the Lynx returns to Earth, again completing its mission in around 30 minutes. XCOR envision they will eventually be able to send the same Lynx spacecraft on several missions, during the same day, based on a fast turnaround of the vehicle during post flight processing. 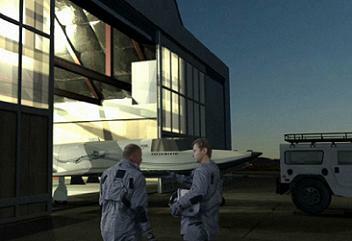 Notably, illustrations show the vehicle being pulled out of a normal hanger – not unlike the RLV hanger near the Shuttle Landing Facility (SLF) – by a jeep, showing a simplicity of operation for turnaround processing. Far more than just a vehicle for rich space tourists, XCOR provide an in-depth overview of their spacecraft’s payload capability. 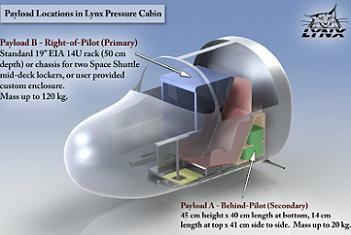 Lynx will also be able to carry payloads in a variety of stowage areas, not unlike – albeit on a much smaller scale – the way Shuttle orbiters could carry custom mass in its middeck lockers. Payload mass restrictions range up to 20kg for Payload A – located aft of the pilot position behind the reclining seat. Specific measurements are provided as a guideline. Payloads up to 120kg can be located in a position besides the pilot position – noted by example of two middeck-sized payloads used on the shuttle. The payload option would be used in the event of just the pilot heading uphill on the Lynx. The CP and CS payload areas – that can carry 2kg of payload – are located in the cowling port and starboard positions on the aft of the vehicle. These areas are likely to be used by cubesats. “Two cowling payloads can be carried on each flight, one on each side of the vehicle in the aft cowling, external to the cabin. Payloads CP and CS each hold a double CubeSat (10 x 10 x 20 cm) or a cylindrical volume that encloses two CubeSats stacked end-to-end (15 cm diameter x 20 cm length),” continued the overview. The ace in the hole for Lynx is the payload capability located in an installed dorsal pod, with two versions, one of which can be used by the Mark I – a 280kg capacity pod, and another more capable version on the Mark III – a 650kg capacity pod. The Mark II Lynx is set to be baselined without the pod option. “Payload D will be mounted on top of the Lynx, inside the external Lynx dorsal pod fairing. This payload can remain in place during flight or be launched by the pilot at the appropriate altitude and trajectory,” the overview added. “The Lynx vehicles offer two dorsal pod options: a small dorsal pod and a large dorsal pod. The Mark I will hold the small dorsal pod (up to 280 kg); only the Lynx Mark III can carry the larger dorsal pod.. 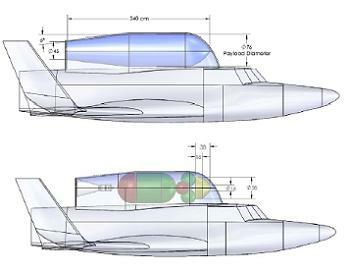 The volume includes a cylindrical collar, with the payload area extending past the aft-end of the cylindrical collar. The dorsal pod has two hinged sections, with the nose of the pod hinged to open fore, and the rear of the pod is hinged to open aft. For a payload riding in the pod, engineers will load by sliding it in axially from the nose of the vehicle. 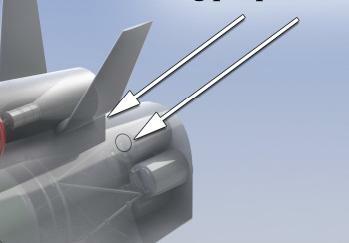 It will be held in place by spanning an aft ring and a fore tab, engaged when the fore fairing cover is closed. There will be three techniques available for launching a payload from the dorsal pod; a payload-supplied spring, sized to payload requirements, Gas pressurization, supplied by the vehicle, or an upper-stage developed by XCOR themselves – although there will be a trade-off between payload mass and upper stage (propellant) mass, directly influencing the altitude achieved by the payload. 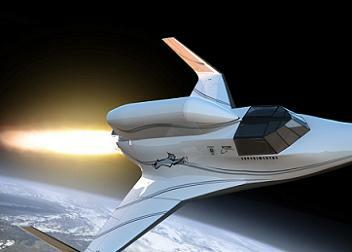 XCOR predict they would be able to send a payload to a 400 km circular, 28 degree inclined. orbit for a 15 kg payload on an XCOR expended upper stage. The presentation also covers numerous other elements of the vehicle, as it prepares for its first flight test late this year or early 2013. (NSF and L2 are providing full transition level coverage, available no where else on the internet, from Orion and SLS to ISS and COTS/CRS/CCDEV, to European and Russian vehicles.